* Who is Ernest Nsombo of Astres de Douala? Nsombo, apparently a striker, has scored four league goals since 13.03.2011 and has forced his way into the first team of the ambitious club. * Frédéric Nguidjol of Canon de Yaoundé is currently in top form and scored his fourth league goal since 30.01.2011 last Sunday. Nguidjol is a talented striker who played for Tiko United FC in 2009-2010. I am currently trying to find more information about the player. * A few weeks ago, Camfoot.com presented Ewangue Mbongo (born 13.03.1993), the promising striker of Cotonsport FC and the Cameroon U-20 national football team. 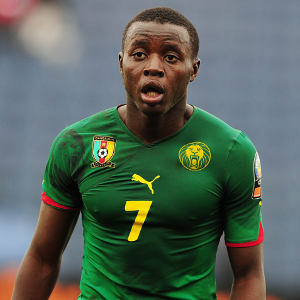 Mbongo scored one goal during the 2011 Orange African Youth Championship in South Africa a few weeks ago and made somewhat of a breakthrough despite being mostly a fringe player for the Cameroon U-20 national football team. According to Camfoot.com, Mbongo is a product of a club called Jeunesse Sportive Saint Julio from Douala, the biggest city in Cameroon. Mbongo is presented as “le jeune prodige” (the wonderboy) from Cotonsport FC and is described as a very athletic center forward, apparently 182 centimeters and 71 kilos, who loves to make dangerous runs inside the box. His idols in football are Thierry Henry and Nicolas Anelka, both great strikers. Mbongo has already scored two league goals during the MTN Elite One 2010-2011. * Medrano Tamen (born 29.03.1986), the petit midfielder of Tiko United FC, has according to unconfirmed reports joined Sunshine Stars FC of Nigeria. Tamen was part of the Cameroon team for the 2006 FIFA Beach Soccer World Cup. Tamen is highly skillful and hard-working and could very well make a good impression in Nigeria, should this transfer have taken place. * Below is my unofficial list of top scorers in the MTN Elite One 2010-2011 after 17 rounds. Hilaire Momi, the burly striker of Cotonsport FC and the Central African Republic, is still way ahead and could possibly have scored a couple of more goals than the eleven I can document.